Elon Musk is known for pushing technology to its limits, yet he might have met his match with the tech from a galaxy far, far away. The SpaceX CEO recently shared a photo of a visit to the set of Star Wars: The Mandalorian. The tech mogul shared the above photo on Twitter, inciting speculation that he could be wielding some device he had developed. However, the background of the photo looked familiar to his followers, resembling something found in Star Wars as opposed to his laboratories. Shortly after, The Mandalorian producer Jon Favreau shared a photo of the two together, seemingly confirming that Musk merely dropped by the set of the live-action Star Wars series. The filmmaker added the caption, "Discussing hyperdrive technology on set." Given the various ways Musk has pushed space exploration further, we won't be surprised if Musk offered real-world insight into how this technology could work in the series. The friendship between Musk and Favreau goes back many years, as Musk had a cameo as himself in Iron Man 2, which starred and was directed by Favreau. Musk is only one of many recognizable people to have dropped by the set of the series, so we won't count on him actually appearing in The Mandalorian. In the new series, after the stories of Jango and Boba Fett, another warrior emerges in the Star Wars universe. The Mandalorian is set after the fall of the Empire and before the emergence of the First Order. We follow the travails of a lone gunfighter in the outer reaches of the galaxy far from the authority of the New Republic. The series will star Pedro Pascal (Narcos), Gina Carano (Deadpool), Giancarlo Esposito (Breaking Bad), Emily Swallow (Supernatural), Carl Weathers (Predator), Omid Abtahi (American Gods), Werner Herzog (Grizzly Man), and Nick Nolte (Warrior). Stay tuned for details on Star Wars: The Mandalorian, which will debut on Disney's streaming service Disney+ before the end of the year. 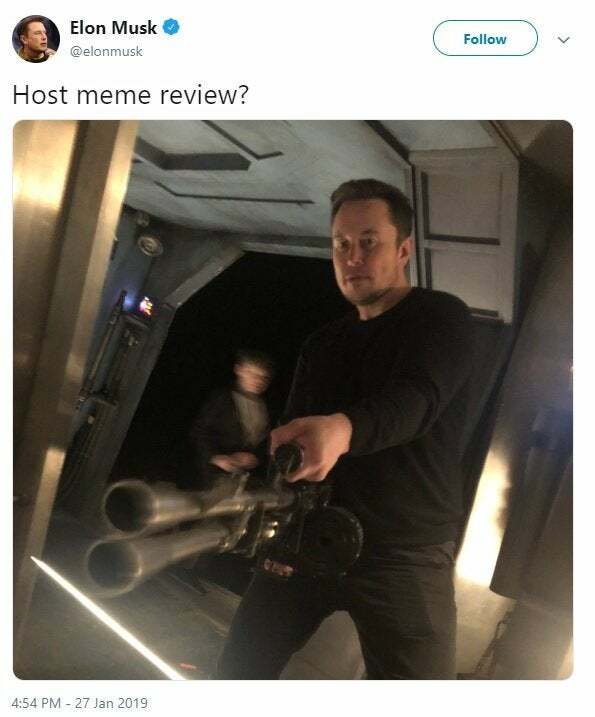 Do you think Musk could have a cameo in the series? Let us know in the comments below or hit up @TheWolfman on Twitter to talk all things Star Wars and horror!